All the reasons to attend the final bonkers party bash at Amnesia this coming Saturday are here. Clearly one of the most outlandish party extravaganzas that Ibiza has ever seen, elrow has thundered through the 2018 summer season triumphantly. Packing out Amnesia on Saturday nights, elrow has maintained its status as one of the most popular parties on the island. 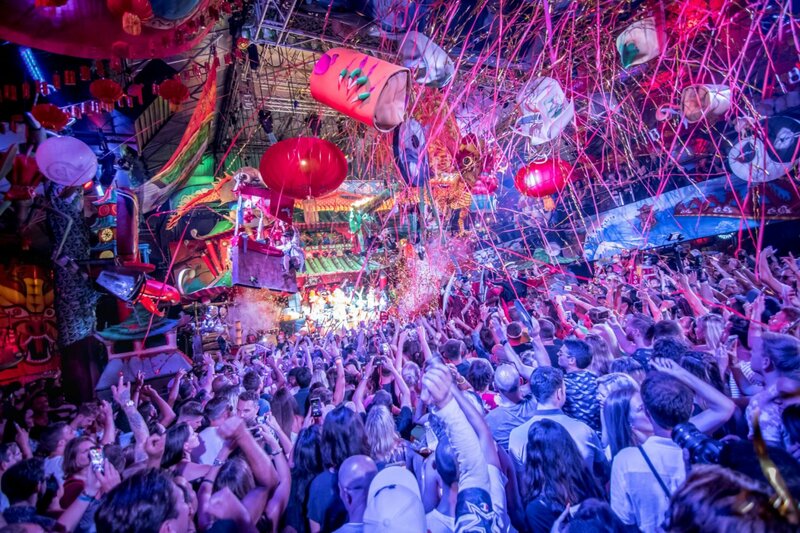 A universally loved party, elrow definitely has something for everyone to enjoy. First-time Ibiza holidaymakers will be instantly impressed by the mad production and characters. More seasoned clubbing veterans will love the line-ups boasting some of the best names in house and techno. Speaking of line-ups, the way that elrow utilises the Amnesia booths is unique in itself. On the Terrace, Saturday nights bring a mixture of techy DJ aficionados and Spanish resident flare. In the Main Room, most weeks feature all night long sets, with DJs like Skream, Eats Everything and Andrea Oliva flexing their mixing muscles for long-haul musical journeys. This year's themes have provided yet another year of cheer and hilarity along the way. From the opening which went all oriental under the guise of Chinese Rowyear to the Carnival stylings of Sambodromo Do Brazil, it was madness. The latter even made its way over to Ushuaïa for an open-air stadium bonanza at the height of the summer season. One thing is for certain: it's been another jammed-packed year for elrow. With the closing party on the horizon, one last chance remains to boogie in the bizarre wonderland. Here's why you should attend the grand finale of elrow this Saturday 6 October. A party isn't anything without the music that echoes and vibrates through it. elrow's closing line-up presents a mix of artists that will almost certainly pack a punch with the best tunes until morning. In the Club Room, Eats Everything returns for another all-night-long that will have ravers reaching for the lasers. The Bristol dwelling superstar continues to reach higher heights in his career. From running his label Edible to signing releases on both Carl Cox's Intech and Josh Wink's Ovum Recordings plus touring globally, he certainly is one of the most in-demand DJs on the scene at the moment. Over in the Terrace, the stage will be filled with some of the best artists that the dance music scene has to offer. The headliner also is indeed a special one. An important figurehead within the Amsterdam clubbing scene, Joris Voorn is a DJ who does not know the first letter of the word formulaic. Bringing exceptional style and power to every set, he drops a vast array of tunes spanning multiple electronic music styles. Joining Joris on stage will be the masked man, the mysterious DJ entity that is Claptone. His rhythm-driven beats will get the elrow crowd moving - that's for sure. Hot Creations lad wAFF will be going back to back with De La Swing, an elrow resident since 2012. Completing this fabulous collection of artists for the closing are George Privatti and Tini Gessler, two names synonymous elrow in Barcelona. For more mad tunes from straight from elrow, head here to listen to our Spotify playlist. elrow sets its self apart from other parties in Ibiza by going over the top with its decoration and character costumes. It really defines the party's fun-loving albeit slightly insane spirit. Some serious effort goes into all this caper. Everyone who works for the event enjoys his or her job to the max, as you can read when we visited backstage last year. For those visiting elrow for the first time, you are in for a treat. The visual brilliance of the whole party is outstanding, to say the least. The bold colours of every corner of the spectrum on display utterly transform Amnesia as no one has seen before. Want to see what this actually looks like? Check out our video below. For the gargantuan closing, they've gone all sci-fi with a theme that tips its hat to visitors from another world. Rowsattacks! takes you to the planet of ROW. It's the year 3135. All beings have been transported to an interstellar location where it rains constant confetti and the castles of the cosmos are made of inflatables. Roweros, the men in black, the ghost fighters and the V lizards and all clubbing aliens of the galaxy will gather for a non-stop party. Stomp along with these galactic beings all night long. A party that has a funky chicken as its mascot says it all. elrow encapsulates glee and outrageousness. The vibe at these parties is downright hedonistic. Here you are free to be as wild and crazy as you want to be and then some. Combining this with the music and themes, you can easily see why elrow has been a fantastic success on the White Isle for the past seven years. The party's history goes way back - hundreds of years - but the wacky and zany soul of this party first came to Ibiza in 2011, landing at Benimussa Park for one date only. The following two years they did seasons in Privilege's Vista Club and then moved to Space in 2014. That's is where I personally first witnessed the magic of elrow, my first time on Ibiza in 2016. I have extremely fond memories dancing like crazy with my two best mates as Eats Everything dropped Blue Monday. And that's the point of elrow: it's a party that creates those distinct clubbing and holiday memories that will last a lifetime. If you've never visited before, the closing is the perfect opportunity to get wrapped up in the crazy high jinx with your friends old and new. This party regularly sells out, so grab your ticket ahead of time. Full details below.